Sold through Tesco's, the Gateway MT6839b (£599 inc. VAT) provides impressive performance and usability. 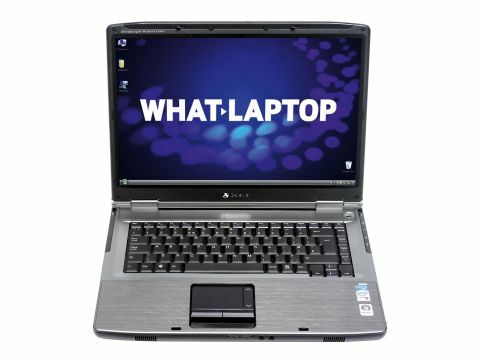 Offering powerful components at a low price, it shows how affordable high-quality laptops have become. Its brushed aluminium palm rest and silver chassis give a stylish look for the home or office. The keyboard impresses with a comfortable and smooth typing action. Equally efficient are the large and responsive touchpad and mouse buttons. The chassis weighs 2.9kg and we were able to work comfortably on short journeys, but it's too heavy for frequent travel use. The 176-minute battery life provides nearly three hours of uptime and easily kept us working on the daily commute. For work and entertainment, the 15.4-inch screen is stunning. Both colourful and bright, it is ideal for photo and video editing as much as DVD playback. However, powered by an integrated Intel graphics card, anything more than basic gaming is impossible. With Windows Vista Home Premium installed, its Media Center software provides a one-stop hub for your multimedia files. Vista also provides increased usability and internet security over Microsoft's Windows XP. Day-to-day performance is impressive. An Intel Core 2 Duo processor and a huge 2048MB of memory ensure fast multi-tasking. When editing photos, browsing the internet and playing MP3s, the system ran quickly and reliably. Offering comprehensive storage space is a 160GB hard drive. A rewritable DVD drive lets you create your own music/video discs and back up your data. A 4-in-1 media card reader can share files with peripherals, such as digital cameras and PDAs. Getting new users up and running is a generous software package that includes Microsoft Works for basic home office tools, McAfee Internet Security to protect you online, and CyberLink Power2Go for creating your own CDs and DVDs. For connecting to wireless networks at home or on the move, 802.11a/g Wi-Fi can be used in the UK or abroad. Fixed home or office networks can be accessed using 10/100 Base-T Ethernet. Transfer speeds aren't as fast as the Gigabit Ethernet of the Hi-Grade, but are fast enough for basic home and office use. With its high performance, generous software package and stunning screen, the Gateway MT6839b comes highly recommended. However, as it's sold in limited numbers through such a large national retailer, you'll need to act fast if you want to avoid disappointment, before Tesco's stocks sell out.